Last week a language arts teacher at my school asked me to write an elegy to share with her students. At first I thought she meant a eulogy, but she set me straight: an elegy is a poem honoring a deceased person, whereas a eulogy is a speech that is read at a funeral. Who knew? The hardest part was coming up with a subject that could bridge the generation gap between my 42-year-old self and a pack of 130 8th graders. My friend Janelle had the idea to write about Dr. Seuss – which was brilliant since his birthday is today! I thought it would be too obvious, but the students really had to talk through each line to identify the subject. It was a very fun activity! Tomorrow a crew of my high schoolers will visit local elementary schools to read Dr. Seuss books with the students, and every kiddo who checks out a book from our library will get a Seuss-y treat. (It’s a frosted pretzel “egg” with a green M&M “yolk” – so fun and simple!) Even big kids still love Dr. Seuss! And of course we held a small celebration here at home tonight. 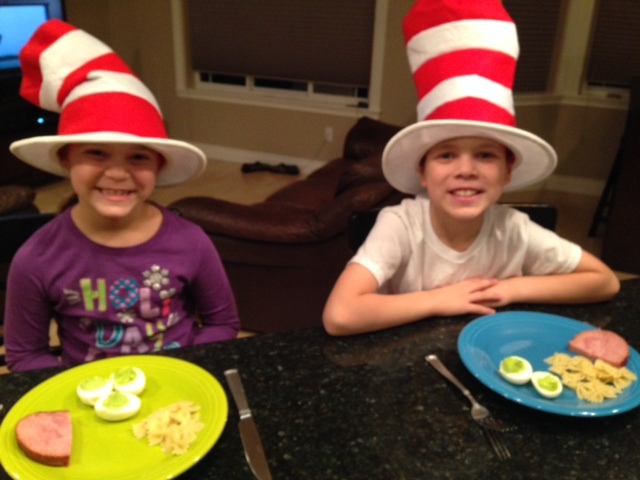 Maggie read Green Eggs and Ham while we prepared our Seussian dinner of ham, greenish deviled eggs, and Cat in the Hat bowtie noodles. Can’t wait to celebrate tomorrow in the library. 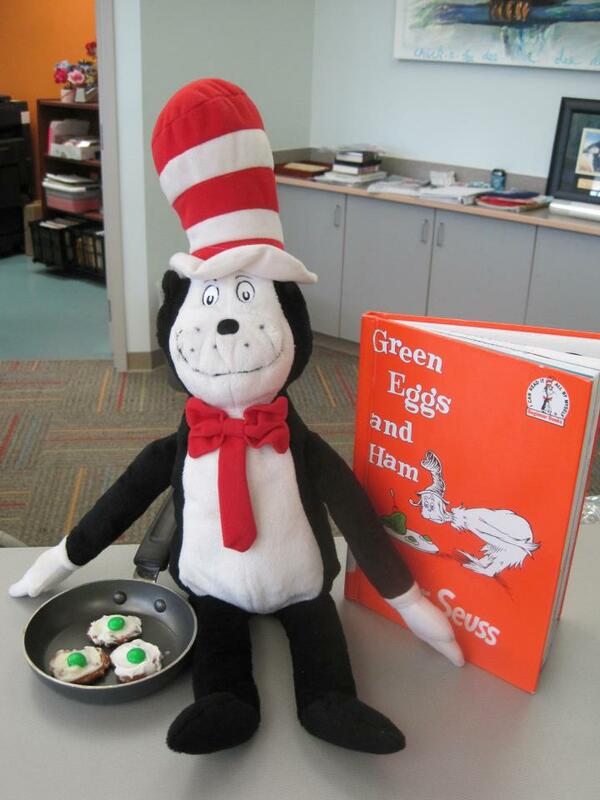 In the meantime, Happy 110th Birthday Dr. Seuss! So glad you published the poem on here…..it was so well done!